News and insights on governance, risk and compliance. Hello. The latest system outage at Wells Fargo & Co. is expected to raise more questions about the bank’s oversight of its technology. Wells Fargo customers and employees experienced problems with their bank accounts late last week as a result of a systems failure, with some saying they had trouble accessing money from direct deposits. The trouble began Thursday when a shutdown at one of the bank's data centers left many customers unable to access their accounts online or on mobile applications. The bank said the issue wasn't due to a cybersecurity event. It also said many services were restored by Thursday night, including most mobile and online systems, credit and debit card transactions, and ATMs. A bank spokeswoman said that overdraft fees and other charges related to these issues will be reversed. It was Wells Fargo's second system outage this month. The Office of the Comptroller of the Currency sent Wells Fargo a regulatory warning in recent months that can precede an enforcement action, The Wall Street Journal previously reported. 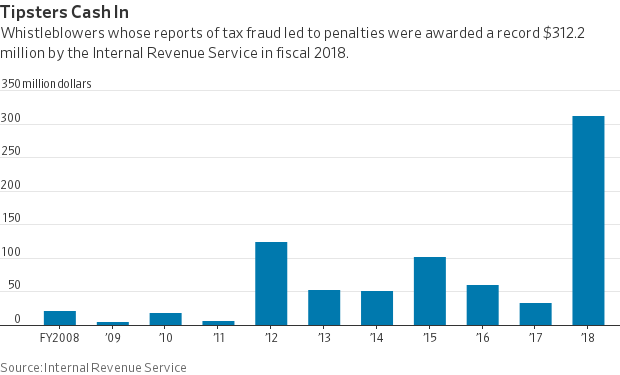 Tipsters who blew the whistle on tax fraud collected a record $312.2 million in awards during fiscal 2018. The total was more than six times the average annual figure for the previous ten years, according to the Internal Revenue Service. Individuals who provide original information to the IRS about tax-law violations are eligible for a reward if the tip results in a penalty. Tax whistleblower awards represented 21.7% of the amount collected under the IRS program, which was $1.4 billion, the agency said. Sprint Corp. has sued AT&T Inc. over a branding campaign that it says falsely tells customers they are receiving 5G service on their smartphones, escalating marketing wars between carriers over the next generation of wireless networks. Sprint alleges in the suit that AT&T is deceiving customers into thinking their 4G LTE wireless service is in fact 5G. It is asking the court to block AT&T from using that tag. 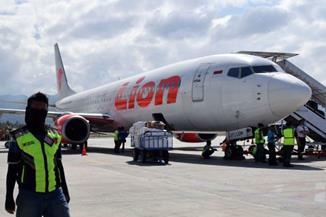 Engineering and regulatory complications are expected to delay safety fixes covering hundreds of Boeing Co. 737 MAX jets until at least April, according to industry and government officials familiar with the details. 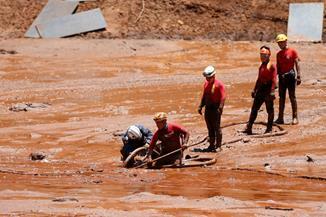 Mining giant Vale SA had denied owning the sort of mine-waste dam that collapsed in January and killed at least 157 people at one of its old mines in Brazil, underscoring the industry’s reluctance to disclose information about such structures. Hasbro Inc. reported a 13% decline in sales during the holiday season, the latest indication of how toy makers struggled following last year’s liquidation of Toys “R” Us. Rival Mattel Inc. also reported a drop in sales for 2018’s final quarter, down 5%. Global regulators must revamp the way they assess new threats to the financial system, as the tide of postcrisis rules crests and the financial sector evolves, a top Federal Reserve official said Sunday. The U.K. economy experienced its weakest growth in six years during 2018 as businesses slashed investment in the face of growing uncertainty about the way in which the country will leave the European Union. Low unemployment rates mean companies can’t risk dragging out their hiring processes. If they do, staffing consultants say, they risk losing the interest of top candidates or worse: losing them to competitors who move faster. More workers were involved in strikes and other labor disputes in 2018 than at any point in the past three decades, fueled by widespread teacher protests last spring, according to data released by the Labor Department. Almost 500,000 workers participated in work stoppages last year, driven primarily by protests in the education, health-care and social-assistance industries, the Labor Department said. Amazon.com Inc. executives are re-evaluating a planned campus in New York City, people familiar with the matter said, turning up the heat on local officials who have rallied opposition to giving billions of dollars in tax incentives to one of the world’s most valuable companies. The director of U.S. Citizenship and Immigration Services recently told business leaders supportive of high-skilled immigration that the Trump administration could propose greater flexibility for intracompany transfer visas known as L-1s, which broadly allow a U.S. employer to transfer an executive, manager or professional with specialized knowledge from an affiliated foreign office to a U.S. office. Tesla Model 3 owners face unusually long waits for repairs, a drawback to being a customer of an upstart company that has built a coveted luxury brand but is still learning some of the basics. America’s global campaign to blacklist China’s Huawei Technologies Co. is facing a major challenge on Europe’s eastern flank, where countries are debating whether to side with Washington against a Chinese government that has courted the region’s leaders. In the Czech Republic, officials have taken opposite sides on how to balance security concerns raised by the U.S., and the country’s own cybersecurity officials, with the desire for Chinese investment, trade and business opportunities. The Czech prime minister wants to consider restrictions on Huawei, but the country’s president has embraced the company. Jeff Bezos cultivated a persona of the billionaire who did dishes, until his company moved into Hollywood. There, the Amazon.com Inc. Chief Executive took on the trappings of a very different lifestyle, where people and events are much harder to control. The shift became clear to the world a day after his Jan. 9 tweet announcing his pending divorce from his wife of 25 years, when the National Enquirer reported his affair with the wife of the chairman of a top Hollywood talent agency, a former entertainment-show host, including details of their intimate texts. Many big banks merged in shotgun marriages during the financial crisis, but it has been 15 years since two healthy ones pursued a combination of the size of the one announced by BB&T Corp. and SunTrust Banks Inc. While the potential payoff is huge—a more profitable lender better positioned to compete with multitrillion-dollar rivals such as JPMorgan Chase & Co.—so are the pitfalls. Coca-Cola Co. is introducing the first new flavor in more than a decade for its namesake cola. Orange Vanilla Coke and Orange Vanilla Coke Zero Sugar will go on sale across the U.S. on Feb. 25. The move follows a revamp last year of Diet Coke with several new flavors, including Ginger Lime and Zesty Blood Orange, which helped spur a rebound in demand for diet cola. Soda sales have been sliding for much of the past decade as consumers have turned to bottled water and flavored seltzer. Bank of America Corp. Chief Executive Brian Moynihan received a compensation package valued at $26.5 million last year, a 15% raise from the $23 million he earned in the prior year, according to a securities filing. Total compensation for Mr. Moynihan, 59 years old, last year was the largest since he became CEO. Subscribe to The Morning Risk Report here. Follow us on Twitter at @WSJRisk, @kcbroughton, @srubenfeld and @_MengqiSun. Send comments to the Risk & Compliance editor, Jack Hagel, at jack.hagel@wsj.com.